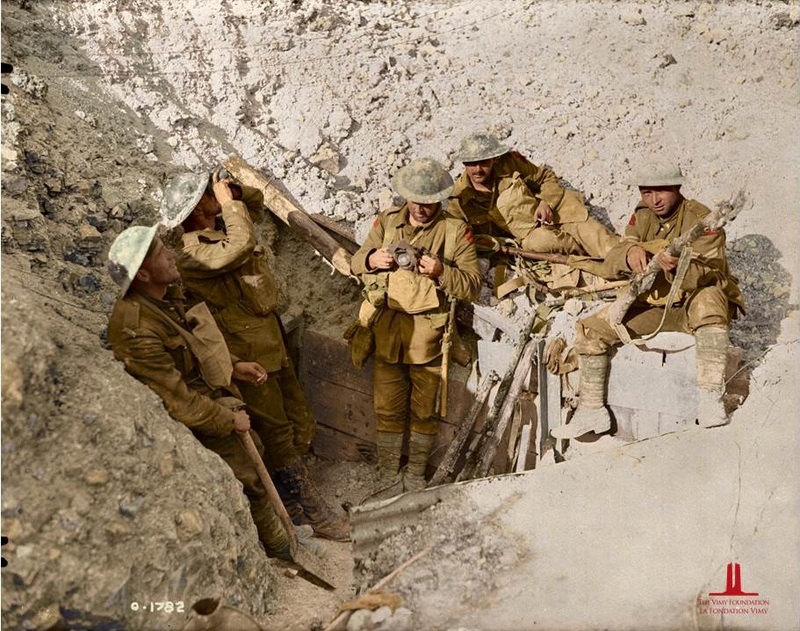 Canadians in captured trenches on Hill 70. August, 1917.
Credit: Canada. Dept. of National Defence/Library and Archives Canada/PA-001718 (modified from the original). Colourized by Canadian Colour. Fought four months after Vimy Ridge, the Battle of Hill 70 was the first large Canadian engagement of the summer, and the first test of the Canadian Corps’ new commander- Lieutenant-General Arthur Currie. The city of Lens, an industrial coal mining centre, had been in German control since 1914, and was overlooked in the north by Hill 70. The original attack, given to Currie shortly after he took command of the Corps, called for the capture of the city by the end of July. Currie believed that Hill 70 was a more important objective, since controlling meant a strong artillery position above the city, and that rather than waste lives trying to take Lens, it would be better to neutralize the hill first and use it to draw the Germans out into an attack. He convinced his superior, General Henry Horne, at a meeting on 10 July of the worth of a more limited attack, and the battle was set for the end of July. Delays caused by poor weather moved the battle into August. Despite the change in plan, Hill 70 was still a very tough objective, and Currie had less than a month to plan and train his troops. Like his predecessor General Byng at Vimy, Currie wanted his men to know their exact objective, and made similar use of maps, classroom teaching, and scaled battlefields to ensure that every soldier in the Corps knew what they had to do and where. 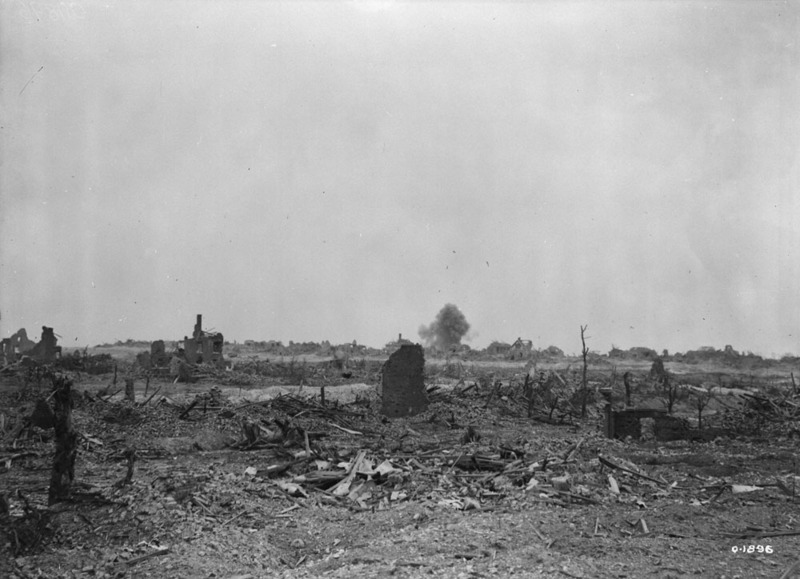 The artillery bombardment unleashed on Lens and Hill 70 left little of the city standing. Credit: Canada. Dept. of National Defence/Library and Archives Canada/PA-001872. 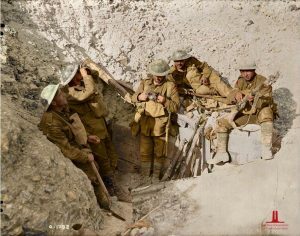 Currie’s plan called for three phases of attack; the first to take the German line at the crest of the hill, the second to take the trenches on the downward slope towards Lens, and the third to take the lower-most arc of trenches at the foot of the hill. All three phases had to be achieved very quickly, so that the Canadians were in position against the inevitable German counter attack the Currie was inviting. At the same time, battalions from the 4th Division were engaged in a feint attack against Lens, to draw German attention away from Hill 70 to allow for more time to consolidate the position. The attacks on 15 August went well, with the formation of a new Canadian front line comprising of parts of the second and third objectives, but German counter attacks began quickly after the initial gains, with the first at 7 am. On 16 August, the 2nd Division completed its objectives on the third line and Hill 70 was considered fully taken by the Canadians. 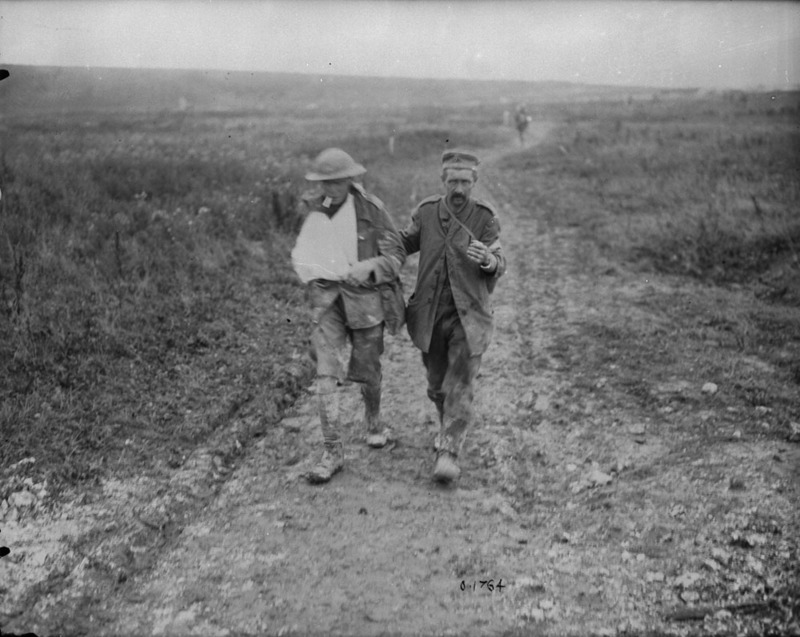 Massed German gas attacks on 18 August made holding the hill miserable work, and many suffered from mustard gas related casualties, which burned the skin and caused blindness. By the end of 18 August, the German counter attacks calmed and the Corps spent the next several days consolidating before Currie ordered them into their next battle on 21 August – the attack on Lens. 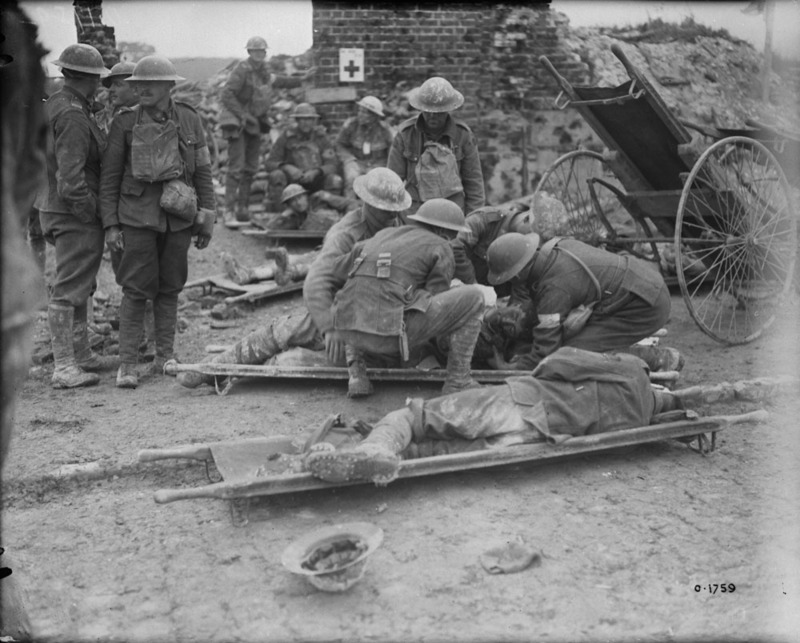 Casualties for the first six days of battle were 5 600 wounded, killed, or missing. 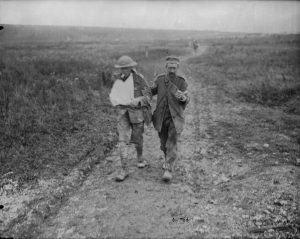 Dressing wounded Canadians during advance to Hill 70. August, 1917.
Credit: Canada. Dept. of National Defence/Library and Archives Canada/PA-001598. Credit: Canada. Dept. of National Defence/Library and Archives Canada/PA-001597. -Both the Germans and the Canadians used poison gas to devastating effect during Hill 70. 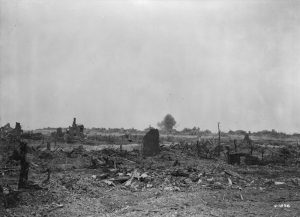 The initial Canadian attack at 4:25 am took place behind a cloud of gas and smoke, which confused the German forces in the city and made them slow to respond. The German Army used mustard gas on 18 August, which unlike chlorine was not immediately detectable, and many Canadians were unwittingly poisoned because they waited too long to put on their respirators. Lieutenant-General Arthur Currie – Hill 70 was Currie’s first battle since his promotion to Corps commander in June 1917. The battle bore all the hallmarks of Currie’s later successes in 1918; careful preparation, co-operation between the artillery and the infantry, and bite and hold tactics. By the end of the war, Currie was considered to be one of the best generals in the British Army. During the Battle of Hill 70 and subsequent attack on Lens, six Canadians received the Victoria Cross for their actions of valour. Over the next ten days we will be posting in-depth accounts of each Victoria Cross recipient on the centenary date of their action. Click on an individual name to be taken to the account of their Victoria Cross. Private Harry Brown (10th Battalion CEF) – A messenger, Brown was badly injured and his partner runner killed while delivering a message on 17 August 1917. He continued on and delivered his message before fainting from loss of blood. Pte Brown died of his wounds the same day. Private Michael James O’Rourke ( 7th Battalion CEF) – O’Rourke served as a stretcher bearer at Hill 70 and worked for three days under heavy fire to ensure that the wounded members of his battalion were evacuated. He survived the war and was the head of a 1 000 strong longshoreman’s strike in Vancouver in 1935. Sergeant Frederick Hobson (20th Battalion CEF) – On 18 August 1917, after a Lewis gun post was buried and the crew killed, Hobson left his trench, dug out the gun, and fired on the attacking Germans until he was killed. Major Okill Massey Learmonth (2nd Battalion CEF) – On 19 August 1917, during a German counterattack, Learmonth was wounded, but refused to leave his men instead directing them first from the parapet and then from the bottom of his trench, all the while throwing grenades. He died the same day of his wounds. Company Sergeant-Major Robert Hill Hanna (29th Battalion CEF)- rushed an enemy machine-gun nest with four other men and captured it on 21 August 1917. Hanna immigrated to Canada from Ireland before the war. Corporal Filip Konowal (47th Battalion CEF)- Konowal was tasked with clearing occupied cellars in the city of Lens during Currie’s second phase of attack after Hill 70. He single-handedly attacked two machine gun nests before being seriously wounded. Konowal survived the war and lived a tumultuously eventful life in Hull, QC. Download our poster about the centennial anniversary of the Battle of Hill 70. Editor’s Note – The term “Battle of Hill 70” is used by historians today to refer to the entire period of fighting from 15 – 25 August 1917. This includes the initial attack on Hill 70 and the attack a few days later on the town of Lens itself. After the war, Canadian Battalions were awarded the Battle Honour of HILL 70, which grouped both attacks as one collective campaign, thus, the “Battle of Hill 70” term endures. As the Vimy Foundation aims to raise awareness of these actions on their centenary, we have chosen to devote coverage to both important battles, based on their respective launch dates. For coverage of the Lens portion of the Battle of Hill 70, visit our Attack On Lens post.